Well, ELFs, we’re not ready for this news actually. Why time passed so fast? I can’t accept they will be left Super Junior for army next year. Super Junior will be miss their leader, Angel Without Wings, Park Jungsoo. 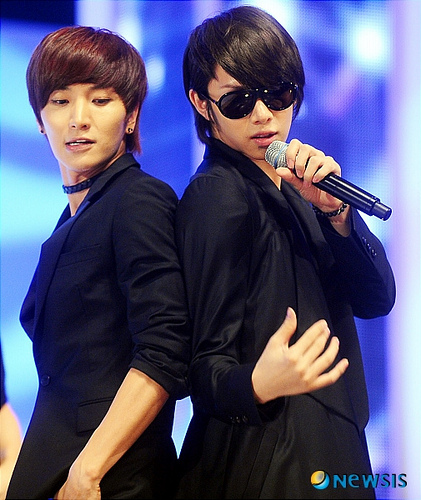 And their evil hyung, Milky Skin White Kim Heechul. We’re gonna miss Leeteuk. Well, what should I said about him? He’s the best leader in this world. I’m gonna miss your tears in concert or TV. This entry was posted on December 17, 2010 by heedina. It was filed under Boy Band, News and was tagged with heechul, kim heechul, Super Junior, Super Junior Heechul, Super Junior Leeteuk. will miss him~!2 years is too long~!park jungsoo is the best leader~!cannot wait till 2 years end~! oh no!! !how can it be!! I hope the 2 years go extra fast. Heechul is my favorit member.I can’t imagine them being in the army I did not know that members of idol groups were suppost to go to the army, but I’m still pretty new to K-pop. If I am correct SHINee will have to go to the army too then. I wouldn’t be able to take it.